Inver is a small village about one and a half miles from Dunkeld on the other side of the river Tay. Before the bridge was built the ferry from Dunkeld made the village of some importance to travellers to and from the north. Today it is still an attractive place but somewhat spoiled by a large caravan site on one side and the roar of traffic on the A9 immediately below. 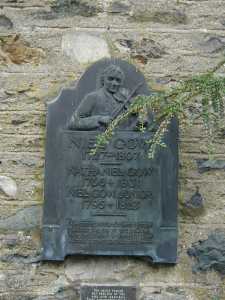 In 1727 Niel Gow was born here, certainly one of the finest fiddlers ever produced in Scotland. He demonstrated his talent early in life and at eighteen played in an entertainment given to Prince Charles. He even joined the Prince’s army, but soon left though he always remained a Jacobite. He formed his own orchestra and was very much in demand at both cottage and castle particularly at the castle of his patron and landlord the Duke of Atholl. Niel was of course, not only a magnificent fiddler but he also composed a number of well-known tunes such as ‘Miss Drummond of Perth’, ‘The Atholl Volunteers’ and ‘Fairweel to Whisky’. He died in 1807 leaving a wife and two boys both of whom later became well-known fiddle players. The house where he lived is still occupied and contains a plaque commemorating the fact of his occupancy there.